One could say that Josh Taylor‘s career has come full circle. Growing up in Chillicothe, IL, Taylor was more into sports than acting and was on his high school’s football, track and baseball teams (his father, George, was the coach). Though he was interested in performing, his busy schedule left little time for it. After graduating, Taylor got a B.A. from Dartmouth College. He pursued a law degree from the University of Denver law school, but never practiced law. Soon after taking his bar exam, Taylor went to L.A. to try his luck in showbiz. It was a good gamble. Working in the restaurant business to pay the rent, he first landed guest spots on TV series such as BARNABY JONES and THE HARDY BOYS/NANCY DREW MYSTERIES. In 1977, Taylor was offered the role of Chris on DAYS, where he remained on and off for almost 10 years. The actor took a year off in 1981 to star in the short-lived cop drama RIKER. When that ended, he returned to Salem until 1987. Toward the end of his run as Chris, Taylor began portraying the father on the sitcom VALERIE. Though its star, Valerie Harper, was written out of the show, the comedy was revamped into THE HOGAN FAMILY, and Taylor stayed on until 1991. The next year, he began recurring on BEVERLY HILLS, 90210 as Dylan’s dad, Jack (who was eventually killed off in 1994). He then went back to daytime as YOUNG AND RESTLESS’s Jed from 1993-94. For the next two years, Taylor kept busy doing TV movies (WHEN FRIENDSHIP KILLS; STAND AGAINST FEAR) and guest-starring roles (MURDER, SHE WROTE; DIAGNOSIS MURDER). 1997 proved to be especially eventful: First, he took over for Michael Tylo as Quint on GUIDING LIGHT. Then, he was asked back to DAYS … as Roman. Not only was it a recast role, but one of the previous portrayers, Drake Hogestyn (ex-John), was still around. Things got even more interesting for Taylor. He wed Lisa, a flight attendant, in 1999. 90210 then revealed that his character was alive and invited him back for a few more appearances (which he did while continuing on DAYS). In 2004, Taylor thought that his time at DAYS had come to an end again when Roman was supposedly killed by the Salem Stalker. However, his character (along with many other Salemites) was revealed to be alive. Recently, DAYS’s original Roman, Wayne Northrop, returned as Dr. Alex North, which makes Taylor part of a historical soap trio in which three actors (including Hogestyn) have played the same character on the canvas — and all three originally began as someone else on the same show. Birth name is Tommy Tim Taylor. Majored in sociology at Dartmouth. His father, George Taylor, who was the coach at Chillicothe Township High School (where the actor was a quarterback) was voted into the Illinois Coaches Hall of Fame; the athletic field was named "Taylor Field" in his honor. Was first noticed tending bar near the popular Burbank Studios where DAYS was being cast. 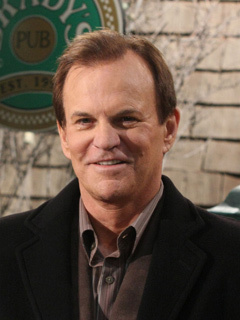 Happy Birthday To DAYS’s Josh Taylor!